Ray brings over 30 years of experience working in one of the largest county governments driving award winning performance and service delivery. 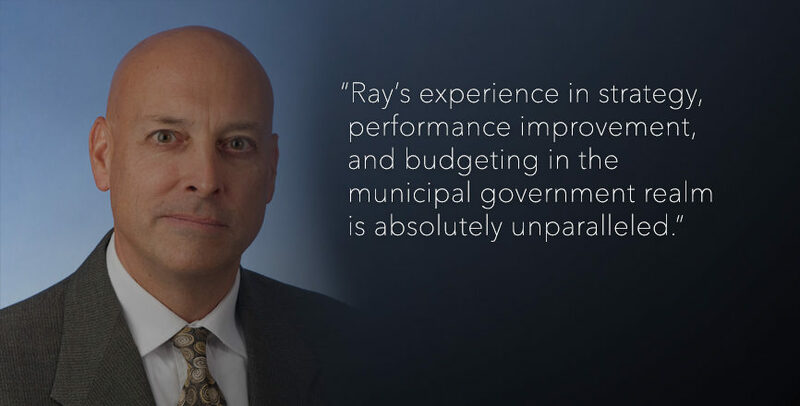 Ray spent the majority of his career with Miami-Dade County government rising to the leadership of the Office of Management and Budget where he oversaw the management planning and performance analysis team. Ray’s efforts spearheaded the County’s strategic plan, general management system modernizations, performance analysis capabilities, and process improvement successes. The County became nationally and internationally recognized for its performance, winning multiple awards over the past decade from Ventana Research, the Performance Institute, the Council for Excellence in Government, the National Center for Public Innovation, and NACo. His career also included time as a budget analyst, a chief in the solid waste department, and a supervisor in the police department. Early in his career, he spent time as an industrial engineer. Today, Ray focuses on working with city, county and state governments to leverage his best practice knowledge to drive performance both at the service delivery level and at the internal management systems level. Ray is a certified lean six sigma black belt and is a graduate of the Harvard Kennedy School Executive Education Program. He has a bachelor of science degree in industrial engineering from Purdue University. SMI was instrumental in helping the UN to develop practical and effective guidance for strategic and business planning.